i. Normal LTC under provisions of Rule 177 (A/B} and 184 of Travel Regulations. ii. In addition they are entitled to one additional free passage including Sea Passage to their SPR/ Hometown in terms of Gol MOD letter No. 5(30)/07/D(Mov}/210 dt. 28th April 2010. This has been incorporated under Rule 177(c) of Travel Regulations (2014 Edition). iii. As per GoI MOD letter No. 67669/AC/ PS 3(a)/1613/D (Pay/Services} dated 13th March 1973 service personnel and their families are entitled Free Sea Passage of appropriate class once a year to Kolkata/ Chennai & back in addition to LTC." 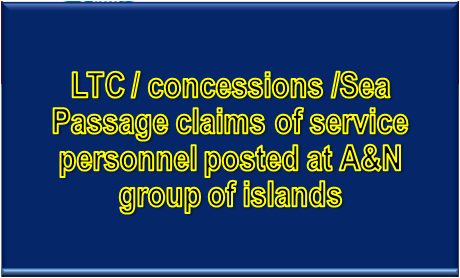 LTC / concessions /Sea Passage claims of service personnel posted at A&N group of islands may be dealt with accordingly.